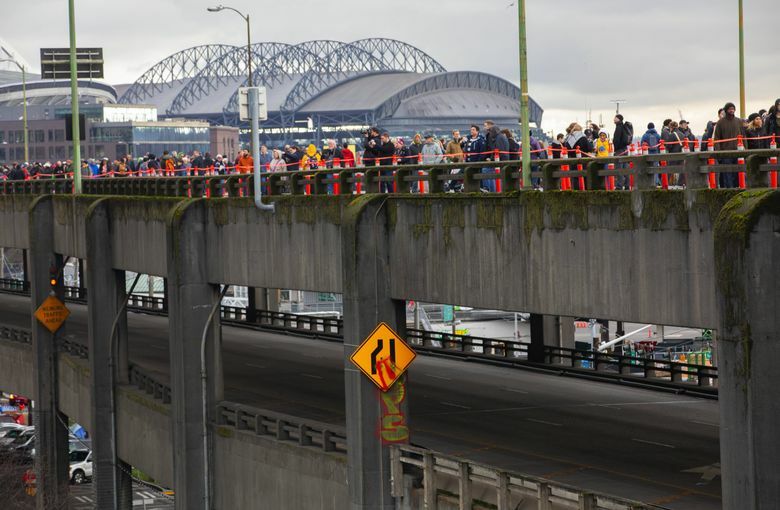 Walking on the viaduct for the last time, Sue Duvall noticed things she never did driving. Potholes, outlined in neon spray paint. The backside of Pike Place Market. Intricate little urban scenes that get swept away at the speed of a car. 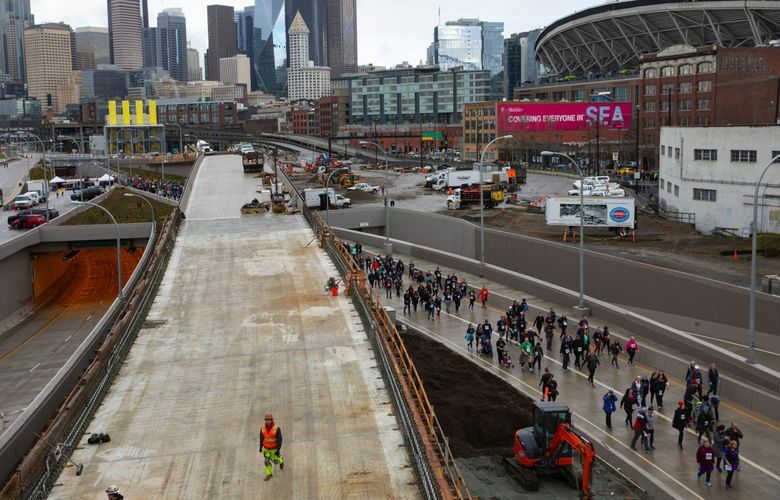 For one day, Seattle had two waterfront highways — both full of (pedestrian) traffic. 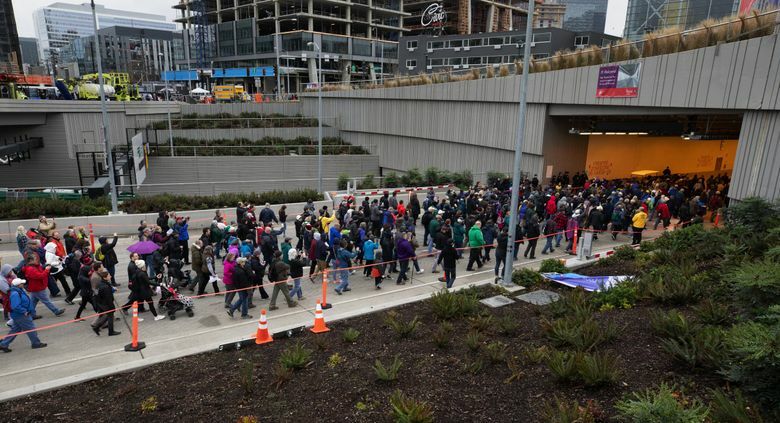 Tens of thousands of people swarmed downtown Seattle on Saturday, traveling on foot through the new Highway 99 tunnel and taking a last stroll on the aging Alaskan Way Viaduct. 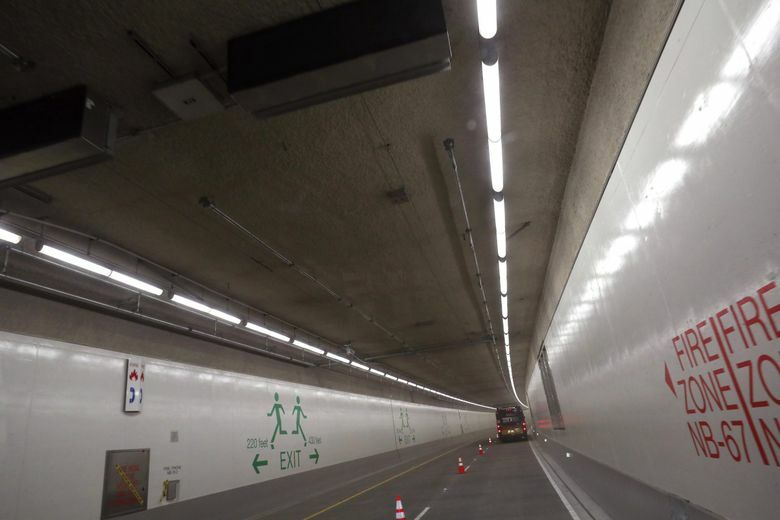 The tunnel is open to car traffic Monday, ending an 18-year viaduct-replacement saga and officially swapping Seattle’s decrepit elevated highway with a gleaming new subterranean one. 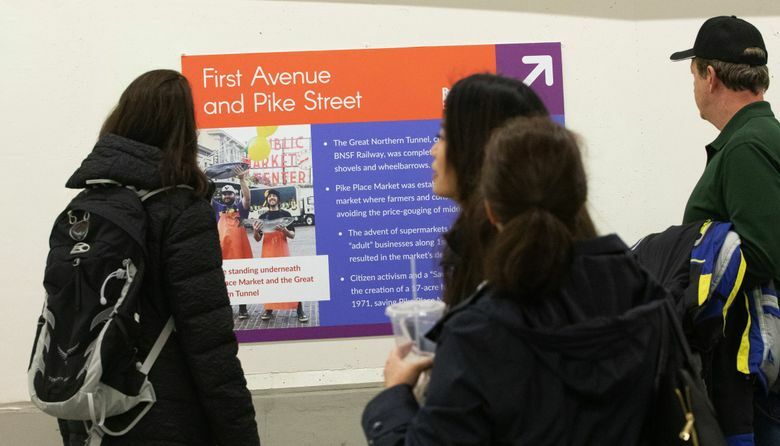 But first, downtown buzzed with pedestrians savoring the rare chance to experience automobile infrastructure on foot — just once before the tunnel opens for cars, and just once before the viaduct comes down forever. 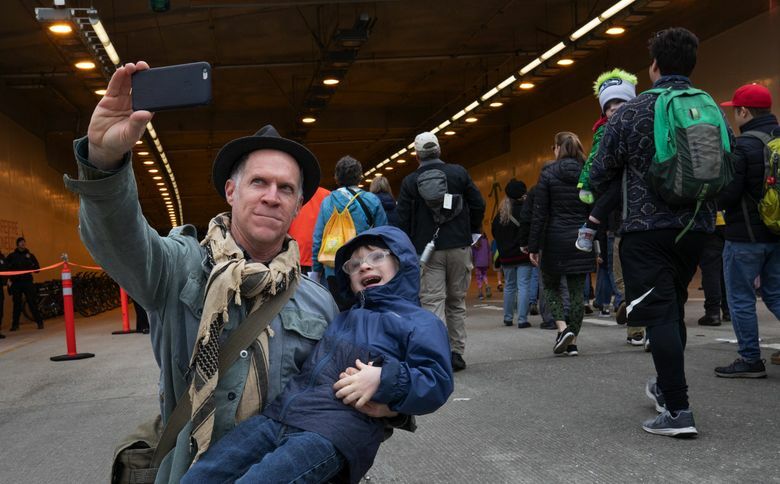 Nearly 100,000 people toured the structures, marching south through the new tunnel and, like a river eddy, flowing back north on shuttle buses and along the viaduct. 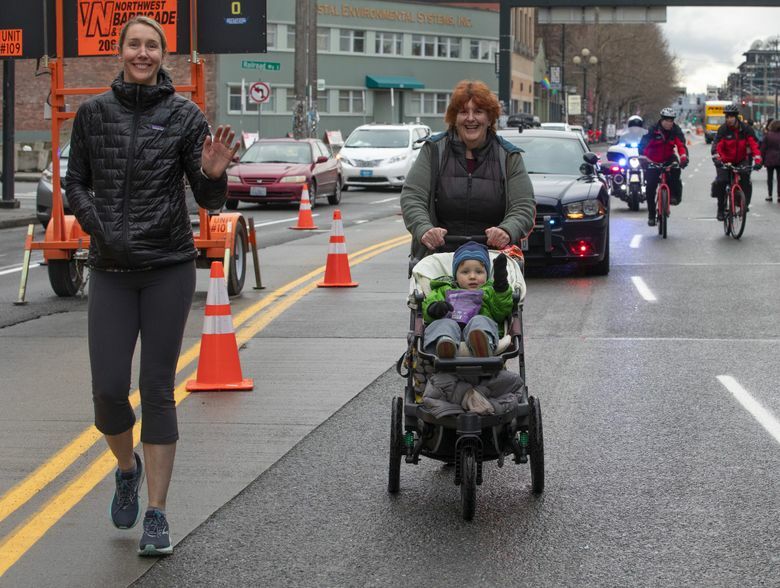 About 29,000 people completed an 8K run/walk Saturday morning and 70,000 people walked the viaduct and the tunnel, the state Department of Transportation said. 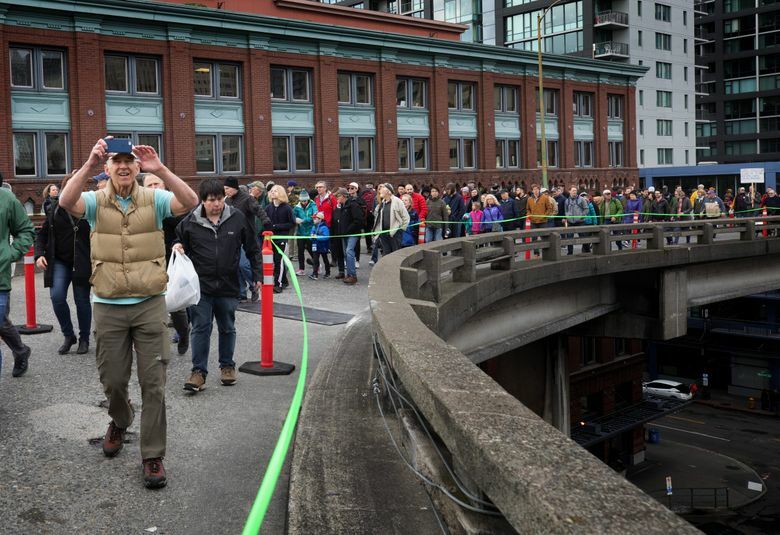 The line to enter the viaduct at Seneca Street stretched the length of four city blocks and lasted an hour. 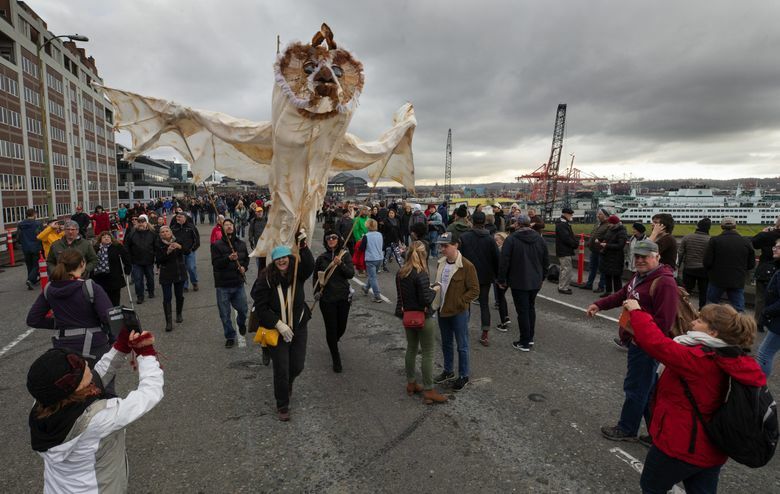 Instead of cars, trucks and buses — the viaduct carried 90,000 daily before it closed — the elevated highway was filled with people, temporary art exhibits and Seattle esoterica. People gaped and snapped photos of the highway, the waterfront, the ferries, each other. Food trucks sold espresso and Taiwanese bao. Musicians — a bass and guitar duo, a band of banjos and ukuleles — played. There was a sockeye salmon mural. A giant owl puppet. And a line of vintage trailers recording people’s memories of the viaduct. Walking on the viaduct for the last time, Sue Duvall, of Seattle, noticed things that she never did while driving. Potholes, outlined in neon spray paint. The backside of Pike Place Market. Intricate little urban scenes — the spaces between buildings and beside stairways — that get swept away at the speed of a car. But the thing that people always mention about the viaduct was the same. 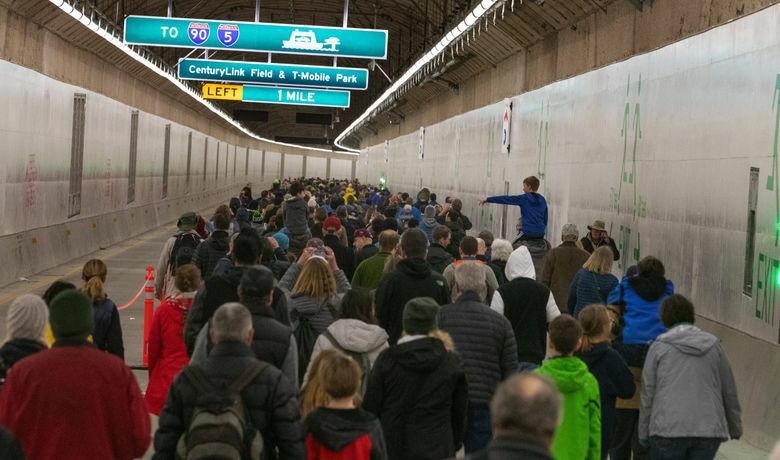 People streamed through the Battery Street Tunnel, which closed to cars forever Friday night and will soon become the final resting place of the viaduct’s rubble. Dingy and graffitied (messages ranged in profundity from “your money enslaves you” to “I love tacos more than you!”), it formed a stark contrast with the $3.3 billion project that will replace it. 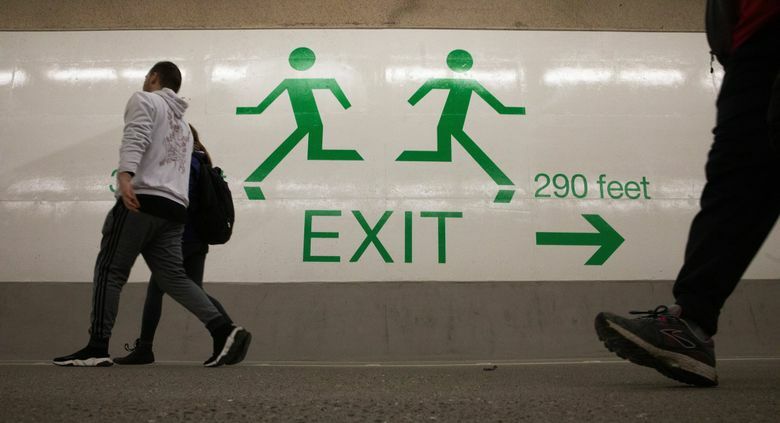 The new tunnel’s walls are a pristine white, with green characters every few hundred feet, pointing the distance to the nearest emergency exits. At an official ribbon-cutting ceremony, dignitaries recounted the eight years of planning and discussion that led to choosing a tunnel and the 10 years of fitful engineering and construction that led to its completion. They lauded former Gov. Christine Gregoire, who chose the deep-bore tunnel in 2009, and praised the workers and agencies that got it built before an earthquake destroyed the viaduct. “I am going to outlive the viaduct, and it is going to come down while I’m still standing up,” Gov. Jay Inslee said. He playfully compared the new tunnel to the Eiffel Tower, the Pyramids and the Taj Mahal. Not everybody at the ceremony was so pleased. Former Mayor Mike McGinn, the tunnel’s most-prominent opponent, ambled in the crowd, but declined an offered spot on the dais. McGinn long argued that we shouldn’t build new highways that exacerbate the climate crisis. But mostly it was a day of jubilation, turning the page on one chapter of Seattle history, and welcoming a new one.